nonchalant mom: VOZ - had to pass this onto you! VOZ - had to pass this onto you! The VOZ collection is something I have wanted to bring to the shop for quite a while now and I just haven't been able to... I love her pieces, they are meticulously made with love and in partnership with artisan weavers. The mission of this company is pure and clearly to help these weavers do the work they love and receive a fair wage. The designer Jasmine Aarons works directly with the weavers to create the textiles and she then assembles them in her NYC studio - you really need to see them to believe. VOZ means “voice” in spanish. VOZ is an ethical fashion company whose mission is to protect the livelihoods, well-being, and cultural values of rural indigenous women globally. They honor and empower artisans creatively, economically and culturally through a collaborative business model that showcases, preserves, and supports traditional art forms. In addition they work in collaboration with politically and economically marginalized women to create beautiful fashion collections and to provide design leadership, training, and opportunity for indigenous women in the rural regions where they reside. They have a primary rural artisan education center is located in Temuco, Chile and supports Mapuche artisans. They have also scaled their operations to include Puno artisans in Peru, and Tangail weavers in India. I just received an email from her, which I thought was a great way to introduce you to this beautiful talented woman. 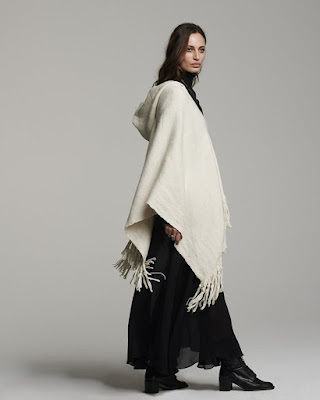 She is offering a beautiful solid poncho for a terrific deal... and I hope this will give you a taste so that you can come back for more and shop at full price - so that everyone benefits from the company mission. If we only buy things when they are on sale (at an incredible price) it's not necessarily helping anyone's bottom line - don't get me wrong we all love a good deal, but it's important to note that in support of these small creators making great things with artisans it only helps when we support the WHOLE business - that means shopping at full price from time to time. This wool poncho hoodie, which is usually $525 - is now $210 - click here to shop! I like to keep things personal in this blog so all posts are done by me and you will find good tips and information to raise your kids in a more natural and healthy way. We like to post on travel, food and fashion! And take a look at our Macrobiotic tips or click on 'Baby' for lots of information on how we raised our kids with tips on healing with food and more!